Cash management is also a vital component of the Treasury. It involves ensuring that cash is dispersed in a timely manner to each accountable government agency in accordance with the budget. Additionally managing the government bank accounts by avoiding idle balances; investing during periods of surplus; and minimizing borrowing costs are important aspects of cash management. Public Bank Account (PBA) of the Government of Maldives is opened and managed at the Maldives Monetary Authority (MMA). The Public Finance Act (2006) governs the establishment of the PBA. Cash and liquidity management refers to controlling the expenditure to improve budget credibility and budget execution to improve cash management practices; and to performing active cash management and avoiding cash shortages. Two committees are established for this purpose. The Internal Cash Flow Committee is required to facilitate the cash management and liquidity management of the Public Bank Account. The External Cash Flow Committee, which have an advisory role, comprises of resource persons from Maldives Monetary Authority (MMA) and Maldives Inland Revenue Authority (MIRA), in addition to the Ministry of Finance and Treasury. A borrowing plan is formulated at the start of each year. The plan identifies the government’s need for finance and plan the borrowing requirement throughout the year based on the cash flow forecast for the year. The plan is amended and updated during the year, as required. All public moneys are kept in Public Bank Account (PBA) opened and maintained by the Minister of Finance and Treasury. These accounts are held at the Maldives Monetary Authority. The exception to this are the moneys kept in islands where a branch of the Maldives Monetary Authority does not exist. 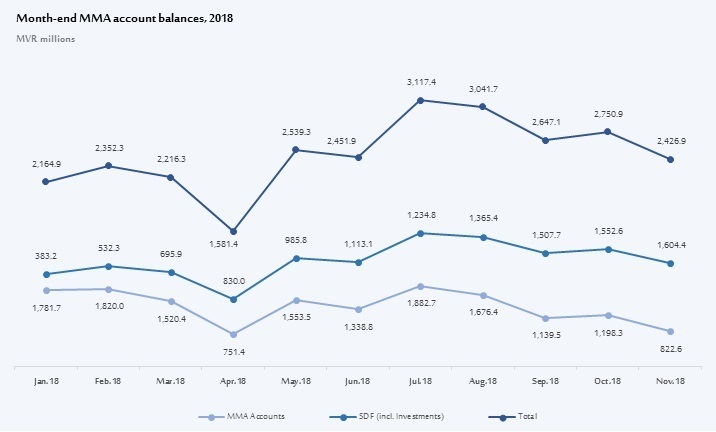 The graph shows the balance of Public Bank Account (Source: MMA). Accounting records for the following public funds are maintained at Treasury and Public Accounts Division. The Ministry is working with MMA on developing a mechanism to establish a full functioning Treasury Single Account (TSA). This will help the government to manage the borrowing more effectively as well as managing the government’s cash flow. Infrastructure Development Projects Accounts (IDPA) holds the money obtained by issuing bonds in the foreign market. Funds from this account are spent on large investment projects, and, when the need arises, on-lent as loans to state-owned enterprises and other government agencies that needs financial assistance. Sovereign Development Fund (SDF) contains funds that are set aside for the purpose of repayment of government bonds and loans, and to strengthen the fiscal reserve of the government. Funds in this account is invested in various financial instruments with the aim of further growing the fund through investment returns.